What do you think of this Snow Joe SHOVELUTION? • Time to toss out the old shovels; back-breaking winter-weather cleanups are a thing of the past with the Snow Joe Strain-Reducing Snow Shovel – the next generation in snow-clearing technology. • Snow Joe's strain-reducing solution greatly reduces the effort, strain and potential injury involved in shoveling, using the powerful muscles of your upper body to do the lifting and throwing, and sending lifting leverage to the lower hand – to reduce back strain by up to 30%. 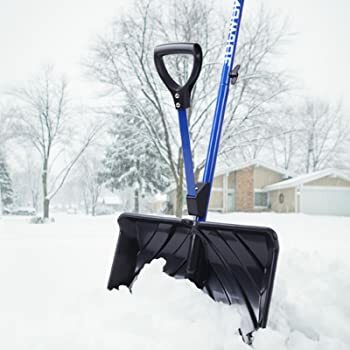 • Plus, Snow Joe's spring-loaded, ergonomic shovel grip captures the expended energy from the act of throwing the snow, to quickly return and reset the shovel, ready for the next load.